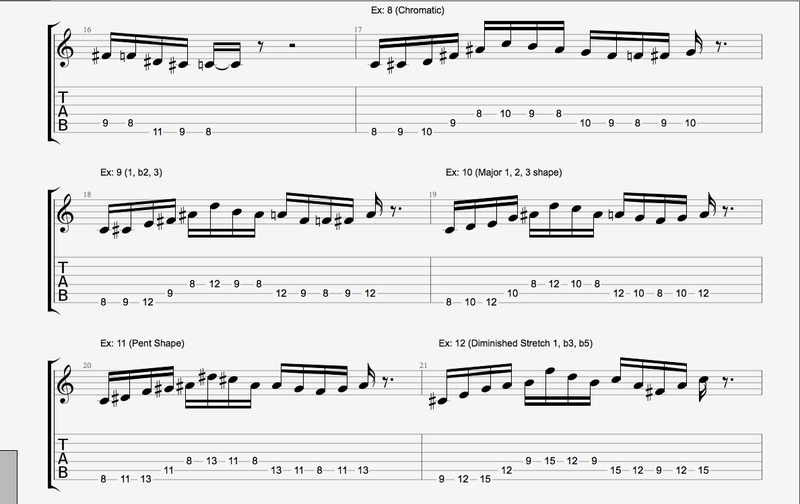 Here are the tabs for the latest video I uploaded, which deals with a technique that I've spent much of my time perfecting over the last couple of years. 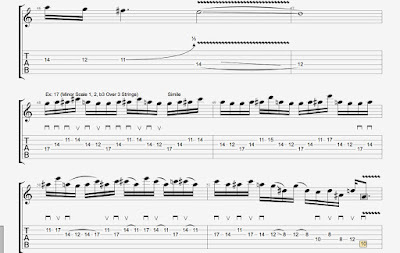 Before going any further, I have to address the fact that this aggressive picking technique is inspired by Jason Becker. His influence on my playing is hard to quantify but I've always admired both his sweep picking and the double stroke pentatonic examples that he showcased in his Hot Licks videos; the examples that I am providing are of my own imagination and diverge a great deal from his but I cannot understate the appreciation I have for having witnessed such amazing playing so early in my development. 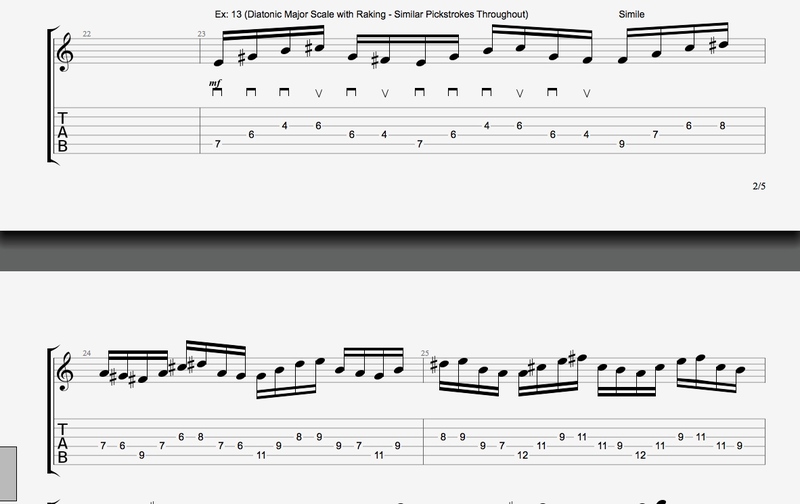 As I mentioned in the info for the YouTube video, I am predominantly a 3 note per string player. Over the years I've come to realize the limitations of this approach and I've done my best to try and expand my own vocabulary within its framework. 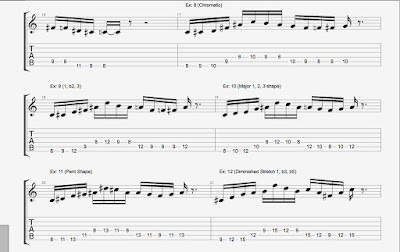 These examples illustrate some of the technical picking motions which make it possible to incorporate short rakes/sweeps into your playing of scales and 3 note per string shapes. 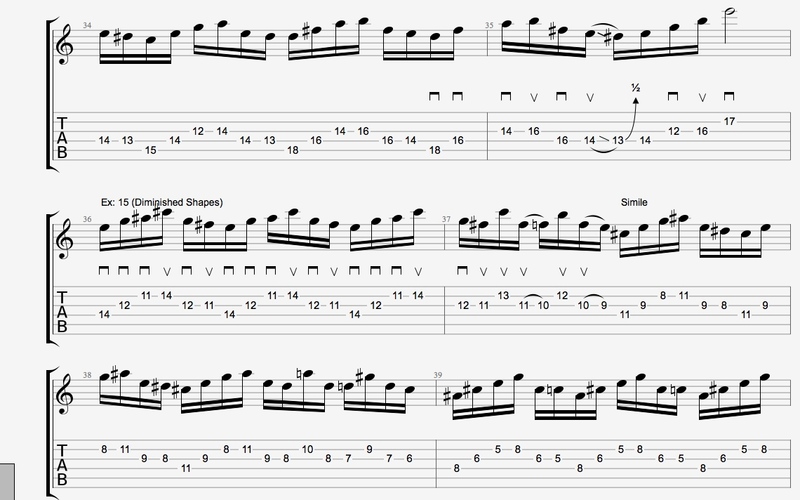 Ultimately this will open up your playing to a couple of interesting ideas, namely: covering larger intervals, reducing the dependance on pure scale-oriented patterns (you'll see that despite the incorporation of 3 note per string patterns, the shapes do differ in sound and look from simple scale playing), an increased strength and fluidity in your right hand, and a better understanding of the fretboard as you delve into various modes. The technique itself is about linking 3 adjacent strings through the raking of triads common to the scale you are using. I've chosen A Major (5th fret on the E string) as a starting point because I feel like it's a comfortable spot on the neck. 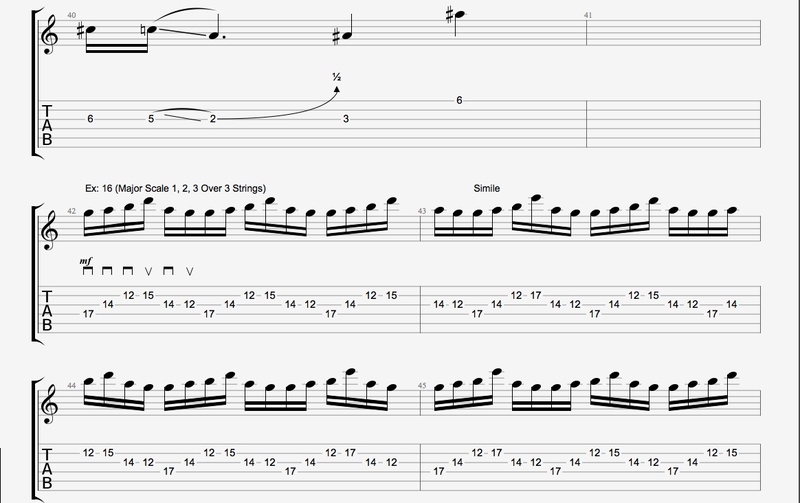 In most cases, the setup for this kind of a pattern will be a 3 note per string alternate picked fragment of a given scale and from that 3rd note you will rake through the triad beginning on that last (or 3rd) note. 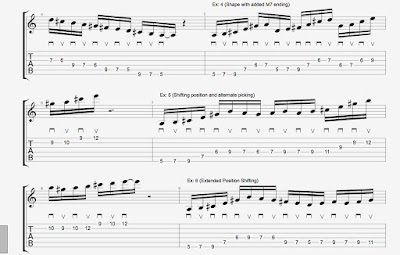 In the first example you play: A (downstroke), B (upstroke), and then finally you will rake (all with downstrokes) C# (9th fret of the E string), E (7th fret of the A string) and then G# (6th fret of the D string). 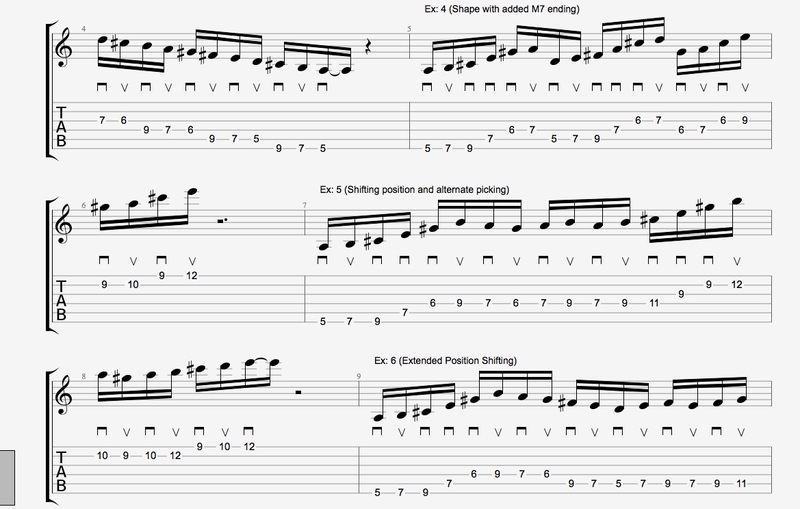 The triad of C#, E and G# is the third triad of the A major scale and acts as an anchor in this technique, almost as if it becomes a set of stairs (raked stairs) leading to a higher point on the fretboard. 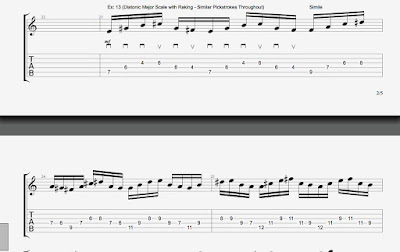 Seeing these triads and understanding their position in the A major scale is imperative, and learning chord scales will help you visualize or be able to sound out what notes do/do not belong in a diatonic sequence. The raking technique itself is played like an ordinary sweeping motion (all downstrokes in these examples), though the wrist is kept stiff and only goes through 3 notes. The upstroke subsequent to the 3 note rake should be snappy and tight, which allows you to progress to the alternate picking pattern which occurs after. 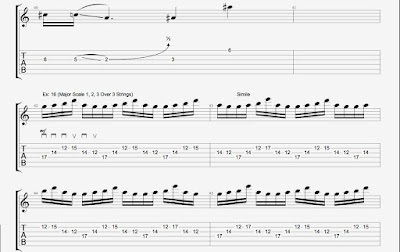 You can also use this technique to climb and string together legato sequences and could sound very smooth if the raking is done lightly. 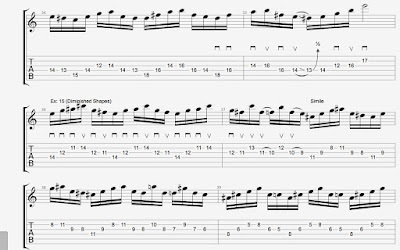 In the YouTube video I play the rakes aggressively but it's still not as punctuated as the picking, which gives the examples a sense of tension and release. The raking also allows the picking hand to relax once it becomes used to the 3 successive downstrokes (immediately followed by an upstroke) and that will ultimately lead to better fluidity and speed. Concerning the latter: speed is only something that should be acquired through the diligent pursuit of comfort. 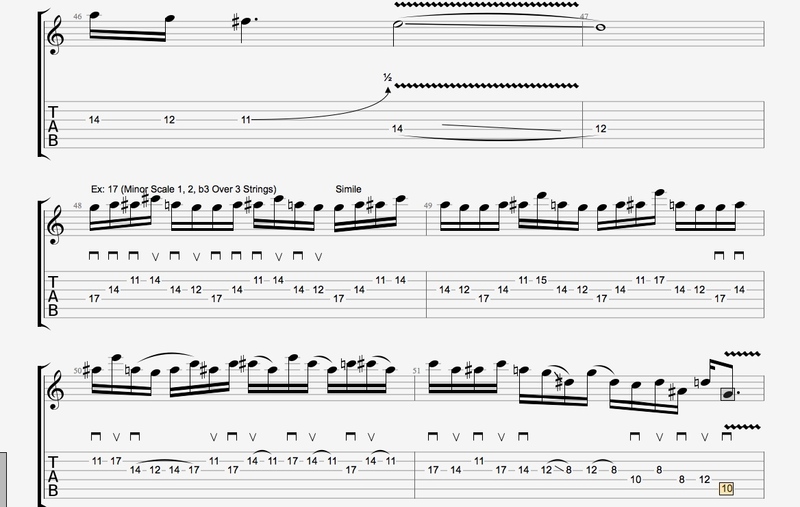 Once the raking becomes assimilated it is easy to add layers to licks of this nature, if I do a follow up I'll incorporate some string skipping into the licks.